It was exactly forty years ago this month that the foundations for Professional Builder magazine were laid and, despite some pretty seismic economic shockwaves along the way, they have more than stood the test of time. Fundamental to that continuing success, of course, has been the longevity of partnerships with key players, most notably the UK’s leading builders’ merchants, manufacturers of the most in-demand building materials and not least the tradespeople themselves who have consistently used the magazine as a tool to help grow and develop their own businesses. The reverberations its launch created in the closeted world of construction industry publishing all those years ago are still being felt today with Professional Builder continuing to enjoy far and away the widest circulation within its sector. Back in the late seventies, the major building material manufacturers of the day were becoming increasingly concerned that the crop of existing building titles available to them only really scratched the surface of this multi-billion pound market – that there was a whole army of smaller builders out there who, for one reason or another, simply couldn’t be influenced through the existing channels. Enter Hamerville Media Group, who took the inspired decision to launch a highly practical, well informed business publication offered exclusively through the strategically placed trade counters of key builders’ merchants. With a circulation in excess of 120,000 Professional Builder was guaranteed to reach busy builders in the process of actively purchasing materials. The rest, as they say, is history, although there have certainly been some hurdles to overcome for all of us over the past four decades. It’s extremely gratifying, therefore, to see so many of those early supporters still with us, and that a significant number have gone on from humble beginnings to enjoy worldwide acclaim. Their continued support, despite intense foreign competition, has been invaluable, as indeed has that of the merchants, who with the emergence of the “sheds” could never have envisaged the tremendous challenges presented to their businesses during this period. Keeping pace with all of the amalgamations and acquisitions has been a full time job, but there is little doubt that – through massive investment in facilities and staff – merchants are better placed than ever to meet the needs of the 21st century builder. And what of their customers? How have builders changed since those dim and distant days of 1978? Despite promises of successive governments to cut red tape, running a small building firm is in many ways harder than ever before. Over the years we have seen the overburdened contractor COSHHed, CONDemned and SAPPED into submission while changes to Building Regulations, Health and Safety, employment legislation, tax requirements and now Brexit are enough to baffle an Oxford Don, let alone a man on site. Today, a builder has to wear more than just a hard hat, turning his practical hand to a multitude of building tasks, while at the same time embracing all the new product technology at his disposal to say one step ahead of the competition – which, despite a number of ultimately ill-fated Government initiatives, remains stubbornly unfair. Yet if we have learned nothing else over the past forty years it is that the small builder is one of the most resilient of all business entrepreneurs, constantly adapting their skills to meet ever changing consumer preferences and trends. Knowing a time when the answerphone and then the pager was considered cutting edge, we could never have foreseen the explosion of new information technology which would come within the scope of the jobbing builder to make the whole process of doing day-to-day business so much more straightforward. And it’s not just the manner of doing business that has undergone such a dramatic transformation. When we started out, it’s fair to say that the general public perception of the building fraternity at large was one of mostly ill-educated, scruffily dressed individuals with choice vocabulary and manners, driving battered old death traps with obligatory missing wing mirrors and heavily dented body work. Today, what began as a trickle has become a veritable torrent, where professional workwear is the norm and personal pride in particular skill-sets is a badge worn with honour and prestige. Vans are more than likely to be top of the range, professionally sign written and providing not only a willing workhorse but a highly efficient organised mobile office. Many of this new breed of builders, with a string of good qualifications to their name, are enjoying the sort of income and lifestyle their fathers and grandfathers could have only dreamed about. For our part, tremendous advances in the word of publishing means that Professional Builder looks very different from the publication of 40 years ago with its extensive use of colour, sophisticated advertising messages and more creative layouts. Not that we can continue to rest on our laurels. The printed world has its own challenges, of course, with the growth of social media and digital based platforms. Of course, we are adapting as we grow, and the fact you are now reading this on your computer or possibly even your phone is testament to that. Nevertheless, visiting sites and merchants around the country, and speaking to visitors at our own Toolfair and Professional Builder Live exhibitions, we are constantly encouraged by the feedback from readers who still crave that element of personal interaction which you can’t get behind a computer or on a smart phone. They openly look forward to enjoying some good old fashioned banter with staff and other builders at the trade counter and a hard copy of Professional Builder, stuffed in the back pocket or thrown onto the dashboard of the cab to digest over a brew, is happily still de rigueur for a vast army of tradespeople. 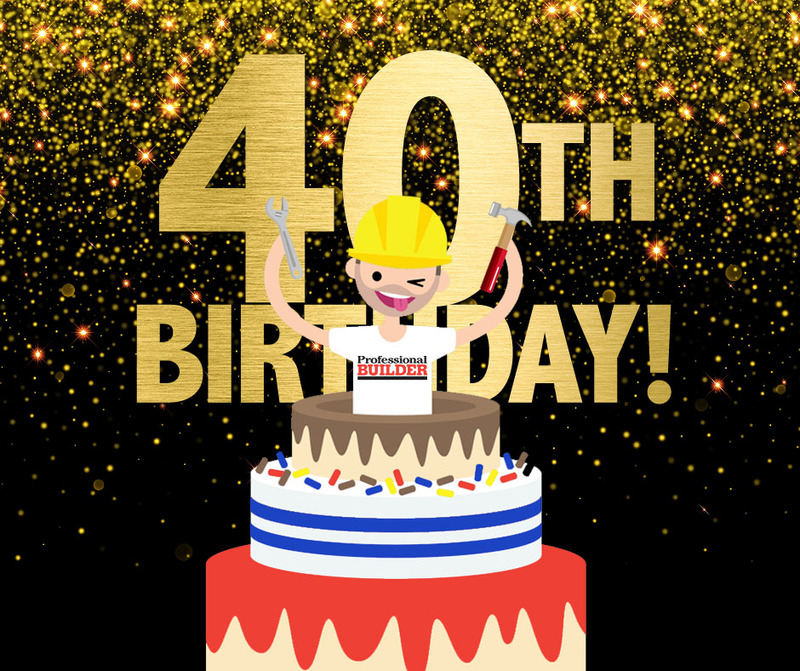 At forty it’s the reason why Professional Builder will continue to strive to put the best product we possibly can in front of your noses every month.